These are the only outfit photos from an entire week in Tahoe, but I do have a lot of photos from skiing that I want to share with you guys. Suffice it to say that the twenty plus inches of snow the area received while we were there made for a pretty fabulous trip. Here's to next time, Tahoe! 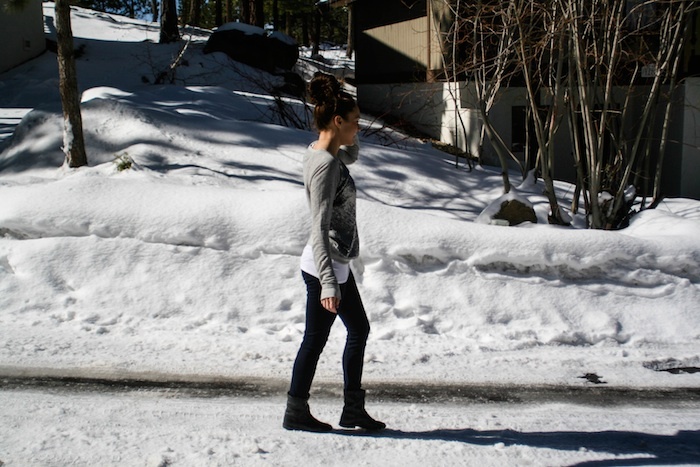 Elizabeth & James sweater (similar), James Perse tank (similar), J. Crew pants, Isabel Marant boots, Tom Ford nail polish in Ginger Fire. Love your sweater! You look great as always! I like your sweater very much. I love this sparkly sweater! And I'm so glad you had an amazing time in Tahoe. :) I can't wait to see pictures! I love your top and even more I love how happy you look! i love that sequined sweatshirt, it is so cute! i love the entire outfit! This is such a lovely outfit hun! I absolutely love the sweater! :)) Great photos! lookin great in this comfy outfit! love the sweater!